At last ! After a wait of 18 months I picked up my new E46 M3 at the dealership. This is my 3rd M car (after 2 M Roadsters) but the first without a classic manual transmission. This car is equipped with SMG II, the brand-new Sequential M Gearbox. Actually it's one of the first customer cars with SMG II which is available in Europe since week 25 (2001). My car went into production in week 26 (2001). 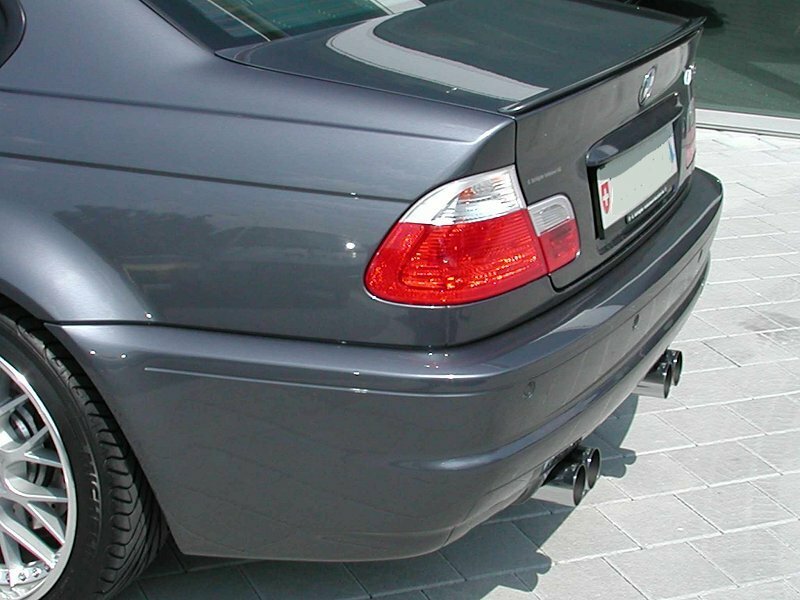 This car is steelgray metallic with Imolared leather interior and Titanium shadow trim. 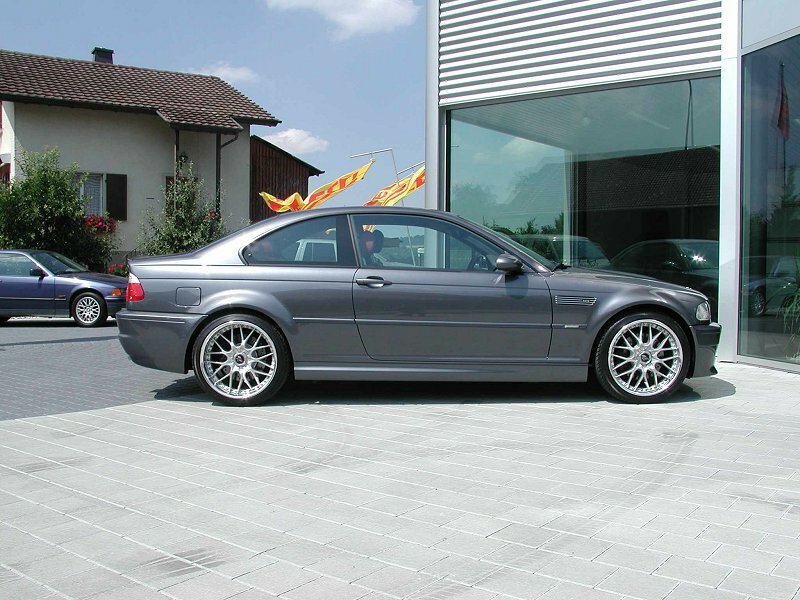 I eventually decided on this combo after I considered about every combo that is currently available for the M3. I'm very happy with it - it's perfect for me. SMG II features a pair of shift paddles and a joystick. the left paddle is for downshifts, the right for upshifts and the joystick is there to choose the mode (S or A) or the R gear. One can also shift with the stick; pull = upshift and push = downshift. The button under the SMG emblem changes the program (S1-6 or A1-5). steelgray is one beautiful color in the sunlight ! It gives the car a very classy and yet sporty look. 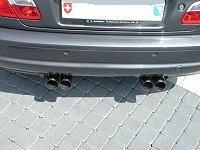 This is the only close up picture of the stock exhaust. I changed it only two weeks later because the car sounded to high-pitched for my taste. Today I had my new wheels put on the car. These are 19'' Work VS-MX with Michelin PilotSport tires. "Work" are exclusive japanese 3-piece rims. They produce their rims only on order. It took 8 weeks from order to delivery - the wheels came in just in time as I ordered 2 months ago. 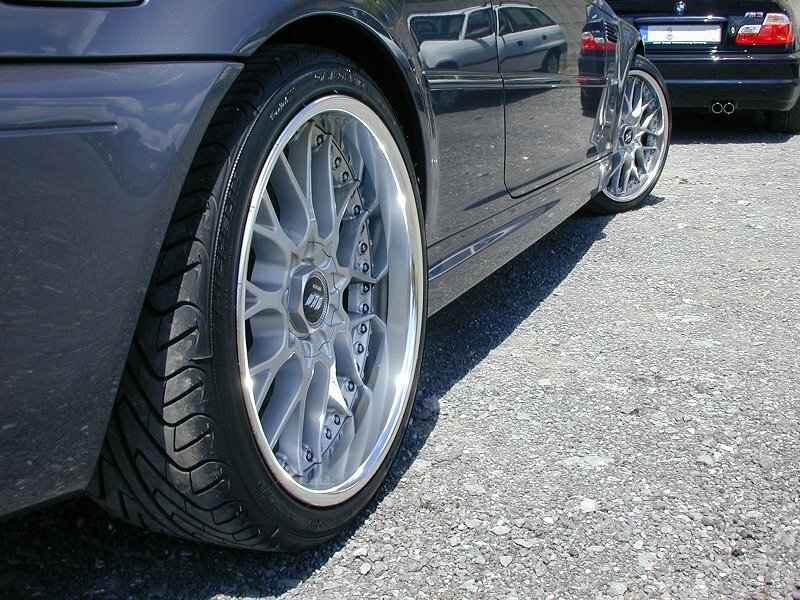 The rims are deep dish (polished) and look awesome ! They look far better in the flesh than on the pics and fit the E46 M3 perfectly well. The Work VS-MX wheels make my car something unique and give it "my" individual touch. 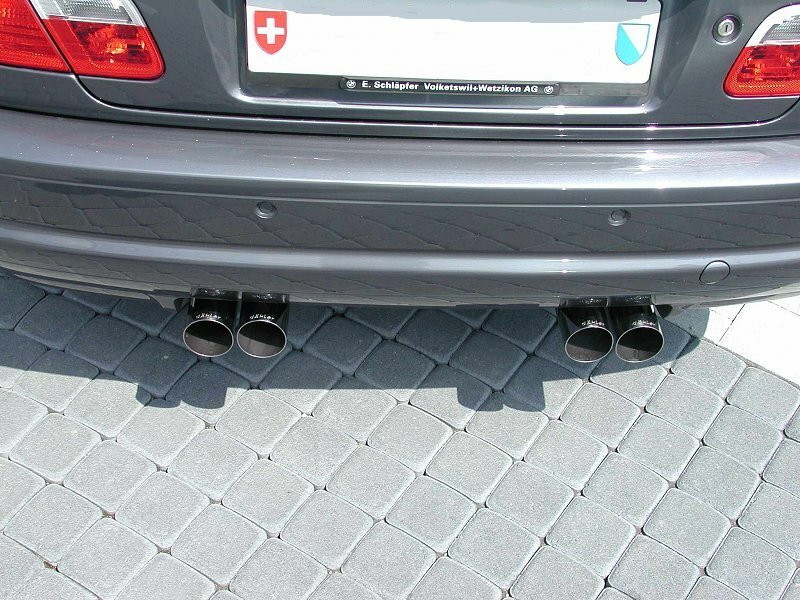 However, the pipes have a larger diameter (7.6 cm each)... and the sound of the car improved dramatically in my opinion. The car sounds much deeper pitched (especially between 1500 and 3000 rpm) and a lot more powerful. Unfortunately it didn't remove the "chain-saw" like sound that is typical for the E46 M3 - this sound is caused by another part (not the exhaust). It comes from a resonator box that is installed in front of the exhaust. I'm planning to remove it as soon as possible. Nonetheless, I'm now very satisfied with the sound of the car. I can definitely recommend the Eisenmann product - it is well worth the money. Thanks for reading about my M3.